I created a SharePoint Framework web part and deployed the package to the App Catalog on my client's O365 tenancy. My client has added the web part to around 150 sites. 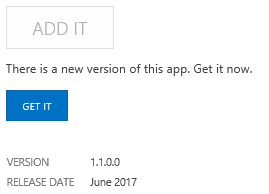 I've since deployed a new version of the package, which contains some important updates to the web part, to the App Catalog. I can upgrade the web part manually on each site from the Site Contents page (i.e. exactly the same as the add-in model). However, I don't really want to do this manually 150 times. As far as I can see, there aren't any hooks for automating or scripting this (CSOM, PnP PowerShell ,etc) - any ideas? You shouldn't need to "upgrade" anything. As soon as you update the package in the app catalog, all running webparts will use the updated manifest, which should point to the updated code.